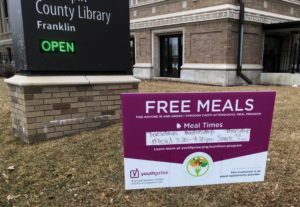 Anyone 18 or under can get a free meal at the Franklin Library on Tuesdays, Wednesdays and Thursdays from 3:30-4:30 p.m. Snack offered from 4 to 5 p.m. This program is offered through the CACFP Afterschool Meal Program and sponsored by youthprise. For children of all ages and their caregivers. Talk, sing, read, write and play together in a format appropriate for young children. Share books, stories, rhymes, music and movement. Start the Year of the Pig with Hong De Lion Dance Association and Hong De Choy Li Fut by watching a Lion Dance performance, a Traditional Chinese Kungfu demonstration and paper cutting demonstrations. Learn Lion Dance moves, drumming, Kungfu and paper cutting! Feel free to attend in traditional clothing. Saturday, Feb. 2, 2:30-4:30 pm Brighten a friend’s day by sending a handmade card! Use local, historical images from Hennepin County Library’s Digital Collections and other provided embellishments to make your card one-of-a-kind. Materials provided. We do everything from urban gardening to digital photo/video to theater. Partner: University of Minnesota. Get creative and make music, videos, animation and other projects using both high- and low-tech tools, everything from iPads and 3D printers to synthesizers and sewing machines. Led by the library’s Teen Tech Squad. U dabaaldag Dhaqanka Soomalida, sameyso saaxiibo cusub iyo in aad isticmaasho hab nololeed cafimaad leh. Lamaane: WellShare International. Celebrate Somali culture, make new friends and practice healthy lifestyles. Partner: WellShare International. Discuss manga and share artwork. Something different every time! Looking for a space to sew, knit or work on other crafts? Bring your current project and materials and join us! Sewing machines, knitting needles and other equipment will be available for your use. Do you want to explore new technology, practice using a computer program, or learn more about the library’s electronic resources? Then come to Franklin Technology Hour! Bring your questions or come and explore a spotlighted resource. Chess, Scrabble®, backgammon, cribbage, Mahjong and more! Come play a variety of games with new or old friends. Games are provided, or bring a favorite from home. The Franklin Learning Center offers free, one-to-one tutoring for adults who are learning English and math, preparing for the GED and citizenship exams, and gaining life skills. We are always looking for community volunteers! No experience necessary; we provide training and materials. Contact us at 952-847-2934 or flc@hclib.org.